I was in Washington, DC for work a couple weeks ago and decided to stay the weekend with a dear friend. When we get together our normal routine consists of many cocktails, sushi, a cooking class and some pretty fantastic restaurant stops. At the time of my visit she was 6 months preggo — so that cuts the many cocktails and the sushi out of the plan. We searched for a cooking class, but everything we found was outrageously over priced. What was left for us to do? Eat of course. In the June issue of Food and Wine, I found a little write up about a new restaurant called Birch and Barley. The article didn’t say much, but it did pique my interest. JDE immediately got us reservations (a month in advance) and we waited. We roll into this restaurant at 19h30 for our reservation — we were quite happy they had power, since 20 hours before a major storm rolled through DC downing dozens of trees and knocking power out across the district. We were seated and greeted by our Michael Phelps look-a-like waiter. He was friendly and very knowledgeable about the very extensive beer menu. They have over 500 beers available. I love beer, but I am far from an aficionado. I decided to put my cocktail future for the night in this man’s hands. 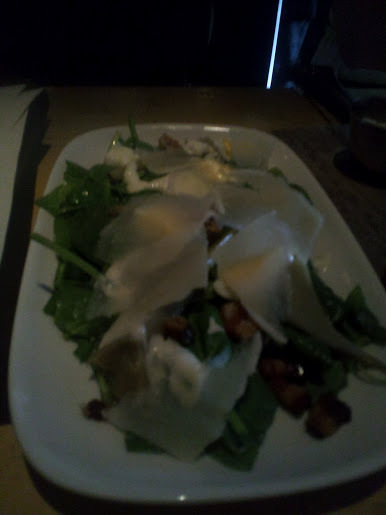 We started off by splitting an order of the Artichoke Hearts, which was a spinach salad served with artichokes, garlic aioli, shaved pecorino and crispy pancetta. This was very tasty. 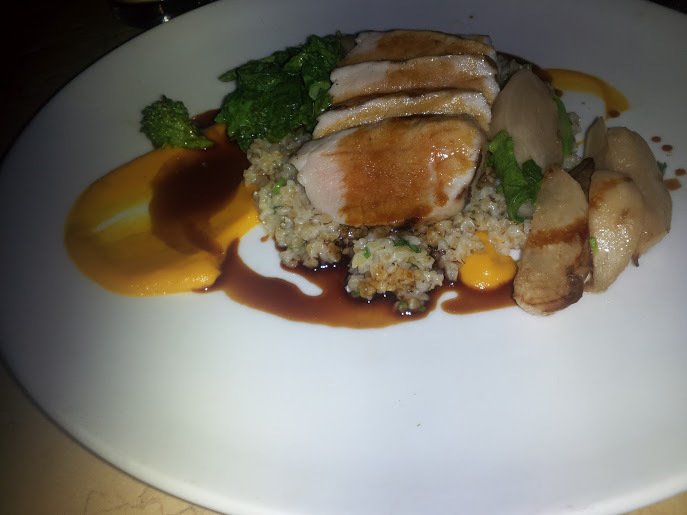 For my entree I decided to have the Grilled Pork Loin which was served with bulgar wheat, broccoli rabe, roasted turnips. The pork was so tender and so flavorful. I love a nice pork loin and this one was top notch. We decided to get dessert — hell, since we weren’t eating a ton of sushi or drinking gallons of wine, we might as well splurge on dessert, right? I decided to get the chocolate peanut butter tart, JDE got the French Toast and MS got the House-Made Cookies and Confections. My dessert was good – not amazing. I didn’t try the French Toast, but I did love the Cookies and Confections. This plate was a modern take on classic sweets from our youth. It included a cashew snickers bar, hostess cupcake, oatmeal cream pie, pudding pop, peppermint pattie, pecan joy and the chef’s favorite breakfast cereal sorbet. I love peppermint patties and this house-made version was great…but not as good as the cashew snickers bar. That dessert was amazing. I could have eaten 5 or 6 of those alone. I was far from a gentlemen and ate half the snickers bar before JDE could have any. I feel a bit bad, but am very happy I was able to enjoy this dessert myself. From the appetizer course, to the entree to the dessert, I asked the waiter just to pick a beer that would pair well with my selections. I had three different beers — I didn’t note the types/names, unfortunately. I was very happy with all of the glasses that were put in front of me. I really liked this restaurant. I would definitely visit them on my next visit to the District. Have you visited Birch and Barley before? What do you think of places with over 500 beers available — great selection or overkill? What is your favorite restaurant in the District? Do you keep track of restaurants you want to try while away from home? By Tim in Food, Travel on July 13, 2012 .